The Alpha Saloon and Hall occupied this site until the fire of 1855. After the fire, another wood frame building was erected and a store and barbershop occupied it until the fire of 1862 which destroyed the new building. Using rock from the local mines, B. F. Woodward erected the fieldstone and brick building that is here today. From 1862 until the turn of the century, the upstairs of the building housed a variety of saloons with names like the Snug Harbor and the Military Saloon. The street level floor was a livery stable. 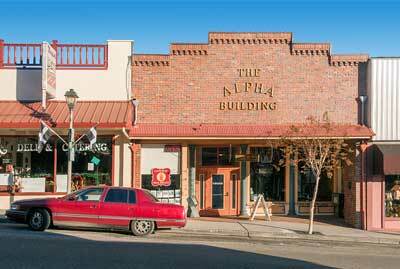 In 1908, the building was occupied by the Alpha Hardware Co. and it was here until the store closed in 1980.